Gort Nation: Enchiladas: Like Heroin, Only Tasty and Nutritious! Enchiladas: Like Heroin, Only Tasty and Nutritious! Since I'm in the process of trying to write a Mexican food cookbook, I figgered with the length of time it might take to write/edit/re-write/re-edit/fund/publish/distribute a dead tree-based document, why not throw a morsel out and see who jumps in to scarf it down like a hungry wolverine (wolverines are COOL). This recipe is the culmination of years devoted to experimentation, disastrous outcomes and piles of half-cooked food tossed into the dumper because I lost focus and messed it up. That, plus some really good advice from my Dad. Thankfully, the reader will benefit from my mistakes and, as long as the recipe is followed somewhat closely, the result will be KILLER ENCHILADAS. Natch, there are countless versions of this dish, all of which will be claimed are better and/or more authentic than mine. Guess what? I DINNA CARE. This one works for me, and as long as my wife likes my enchiladas, I am a happy wolverine. The amazing dish known as enchiladas (en-chee-la-das) is one of those multi-purpose players in Mexican cuisine that is delicious when prepared correctly, horrible when prepared incorrectly, and subject to change without notice if cooked without the right planning and/or ingredients. Basically, an enchilada is a corn tortilla that has been briefly fried in oil, dipped in a sauce, filled with cheese and other assorted ingredients, then rolled into a tube. For the classic recipe, a whole bunch are made up and laid into a roasting pan side-by-side, where they are drenched with more sauce and cheese, then covered and baked before being served to a table of hungry wolverines. There are popular variations to this basic recipe, which include Sonora-style (tortillas stacked like pancakes with a fried egg on top) and chilaquiles (chee-la-kee-les), a Mexican home-cooking favorite that is basically an enchilada casserole. Both of these variants will be detailed later, but we’ll begin with the traditional classic rolled enchilada. Once you have this recipe down, it will be requested for EVERY pot-luck lunch or dinner you are invited to for the rest of your life. Have no fear… your enchiladas will RULE. Note: I use a Presto 'Fry Daddy' deep fryer for all my recipes that require deep frying. I'm on my second one, as the first finally packed it in after frying zillions of tortillas. It was hard to let go, being a gift from my wife and all, but the new one was only $30 from Wal-Mart. I've made funnel cakes, fresh tortilla chips (NOM!) and fried shrimp in it. If you like to cook Mexican or fried foods, this unit is a good investment in kitchen appliances. Three (3) dozen fresh (packaged, non-frozen) corn tortillas, 2lbs. Cheddar or Longhorn cheese, four (4) cans of chopped Black olives, one (1) each large and small can of Las Palmas (or your favorite) ‘Mild’ enchilada sauce, vegetable oil, cooking spray, onions (if you must), additional stuffings (pre-cooked beef, chicken, pork, chiles, etc.). If you use frozen corn tortillas, which I do quite often, separate and lay them out on towels until they thaw completely, which only takes about 15 minutes. Be sure to flip them over a few times during the thaw and keep them as flat as possible. This is one of the more complicated (but not difficult) Mexican food dishes to cook and assemble, but with the right tools and workstation layout, the process goes quite smoothly. In fact, I sometimes draft my wife to assist with making a big batch of these, although I can perform solo with no problems – it’s just more fun with two. My kitchen is laid out with a stovetop on my left and sink on my right, with a counter top in between. As I am right-handed, I work from left to right with the cooking and assembly, laying out the utensils with my assembly strategy in mind. I also like to cover the whole countertop area with cloth towels to lessen any spillage mess. Hey, we’re cooking, right? 2. Grate 1lb. of cheese, empty all four cans of chopped olives into a single container, chop your onion, unwrap the corn tortillas and fan them out on the counter to allow any excess moisture to evaporate. Stash the cheese and olives in the fridge until right before you start cooking. 3. Pour the large can of enchilada sauce into the saucepan and simmer for around 30 minutes, stirring occasionally. This is an important step, as you must cook the sauce down a bit before it will be thick enough to properly coat the tortillas. Be sure to give it a taste and season as you wish, or add a little water if too spicy for you and yours… no shame in avoiding an end product that no one will enjoy because it’s just too spicy. 4. Line your roasting pan with aluminum foil and spray the bottom and sides with cooking spray. If using a disposable tray, you can eliminate the foil but be sure to spray the pan anyways. 5. Once the sauce has simmered and is ready to use, plug in your deep fryer, add 2 inches of oil and wait a few minutes for it to heat up. To test, drop a small bit of tortilla into the oil – if it begins to sizzle crazy and cook right away, the oil is hot enough to begin. If using a frying pan, add the oil and heat up on medium-high until the tortilla bit sizzles as described. 6. Set out the cheese, olives, onions, stuffing meats and chiles on your workstation to prepare for assembly. 7. Take one long swig from your cold beer, wave to the peanut gallery watching, and get ready to roll! 1. Using the cooking tongs, immerse one corn tortilla into the oil, allowing it to cook for about 5 seconds, then grab and flip it around and cook for another 5 seconds. Once done cooking, grab the tortilla and hold it over the fryer to drain off any excess. 2. Immerse the cooked tortilla into the enchilada sauce, covering it completely – no need to turn it over. Once coated, GENTLY lift the tortilla from the sauce and place it on the dinner plate. 3. IMPORTANT – wipe off any excess sauce from the cooking tongs NOW before you make the next enchilada. You DO NOT want to dip the tongs back into the oil with sauce still on them unless you enjoy hot oil splattering all over your head and shoulders. If you have two sets of tongs, use one each for the oil and sauce – otherwise, DON’T FORGET TO WIPE (heh heh heh). 4. Take a small handful of cheese and place it in a line onto the sauced tortilla, adding a small amount of chopped olives and any additional chiles or meats you want to include, but do not overfill. Using your hands, gently roll the tortilla over and around the filling. You have just made an enchilada! 5. Using a spatula, pick up your newly-rolled morsel and place it into the roasting pan. 6. Wipe your hands off, and repeat these steps until you have rolled enough to make one complete layer in the roasting pan. Carefully ladle additional enchilada sauce from the pan over the entire layer, then continue until you have rolled all three dozen corn tortillas… it’s OK to layer them into the pan. You may need to grate some extra cheese during this process, but it will be used anyway, so no worries. If the sauce begins to run low, empty the small can of sauce into the pan and simmer for 15 minutes before continuing. Have another beer. 7. When the roasting pan is full of your rolled enchiladas, ladle some more of the sauce on the top layer, cover the whole shebang with more cheese and scatter the remaining olives over the cheese. 8. Cover the pan o’goodness with aluminum foil, place into the pre-heated oven and bake for 30 minutes. The aroma of your efforts will drive you mad with enchilada desire after about 15 minutes, but be patient… soon come. 9. Remove from the oven, uncover and serve to the assembled ravenous wolverines. AMAZING. The process for making Sonora-style enchiladas is similar to the classic rolled style, but instead of rolling each tortilla with cheese and other goodies and placing them in a pan, lay each sauced tortilla flat on an oven-safe dinner plate and sprinkle your cheese and stuffings in a thin layer on top, then place another sauced tortilla on top of that, continuing on until you have a ‘short stack’ of flat enchiladas. Make up enough plates for your dinner guests, then stash them in a warm oven to melt down the cheese while you fry up a few eggs, sunny-side up or over-easy. Remove the plates from the oven, sprinkle the stacks with cheese and olives, then lovingly place a fried egg on top of each stack and serve. ZOWIE!! According to people who know these things, the enchilada variation known as chilaquiles (chee-la-kee-les) is the real old-school recipe for enchiladas, all done in one frying pan. There are two justifications for this simple method: 1) what else can you do with leftover enchiladas, and 2) can you image a mamacita rolling up dozens and dozens of enchiladas for her entire family while the kids are running around and papacita is calling for another cerveza (beer) and the abuelitas (Grandmas) have just arrived for dinner? I don’t think so. If you have leftover enchiladas and want to do something different with them, just chop and toss them into a hot frying pan with a little oil, cook until crispy on the edges and serve. To make them from scratch, this recipe is a simple casserole consisting of corn tortillas, enchilada sauce, cheese and olives – other chiles and meats are best left as side dishes, and you’ll understand why once you’ve made these for the first time. Unlike the rolled enchiladas, this dish is prepared in one large frying pan, so with the exception of having a few kitchen towels around, the workstation is all about your stove top. 1. Cut the corn tortillas into chip-style triangles – the best way is to take a stack of tortillas, cut them in half, then cut each half-stack into three sets of triangles. 2. Grate the cheese and prepare the olives as before. 3. Place your large frying pan on the stove top and heat up for a few minutes on medium. 4. Pour a few tablespoons of vegetable oil into the pan, allow to heat up for a minute and place the tortilla triangles into the pan. Toss the tortillas a few times to coat them with the oil and cover the pan. 5. For the next 20 to 30 minutes, remove the lid and toss the tortillas and cover again every 5 minutes. After a bit, the tortillas will begin to brown slightly and start crisping up, but this is a good thing! You may need to add a bit more oil to the pan while the tortillas are reaching cooked mega-deliciousness. While we’re not making tortilla chips, it is important for all the triangles to get thoroughly cooked and firm for the sauce and simmer stage coming up next. 6. When the tortillas are semi-crispy and slightly browned, sprinkle a handful of cheese over them and toss until the cheese is melted. 7. Open a large can of sauce and SLOWLY pour over the tortillas. There will be some spatter and mess, but it will be minimal if you take your time. Gently turn over the tortillas until the sauce has integrated throughout, allow the sauce to begin a medium simmer, then reduce the heat to a low simmer and cover again. 8. During the next 30 minutes, remove the lid every 5 minutes and gently turn the tortillas before covering again. You will see the sauce begin to cook down the liquid and the remaining sauce will become thicker and richer. DO NOT STIR THE MIXTURE – gently toss. This is why the tortillas were cooked so much before the sauce was added, otherwise the whole thing will turn to mush. Tasty mush, but mush nonetheless. 9. When you are satisfied with the consistency of what is now officially chilaquiles, reduce the heat to LOW, place several handfuls of cheese on top to cover the mix and sprinkle on some olives. Cover and let sit for another 5 to 10 minutes or until the cheese is completely melted. 10. Pop that lid, breathe in the aroma of the gods and SERVE!!!!!! Something my wife discovered after the first time I made her a batch of traditional enchiladas: THEY MAKE AWESOME LEFTOVERS. Naturally, a second or third meal from all your cooking efforts is a welcome surprise, but our personal favorite is to munch them served with eggs. Whether for breakfast, lunch or dinner, this combo is hard to beat. I know… it may sound a little weird, but you have my personal guarantee on this – fry up a couple of eggs, heat up any leftover enchiladas or chilaquiles, toast up some bread and plate it all up with some sour cream and cheese and YOU WILL BE HAVING THINGS. You know, wolverines love fried eggs. So... enchiladas. Mexican soul food. One of the singular best delicacies I have ever stuffed into my pie hole. When I make them, I feel closer to my Aunt Peggy and Grandma Silva and Dad and all the people who instilled me with a deep and abiding love of this style of cooking. Make them... eat them... savor them... love them. El sabor de mi vida loco. 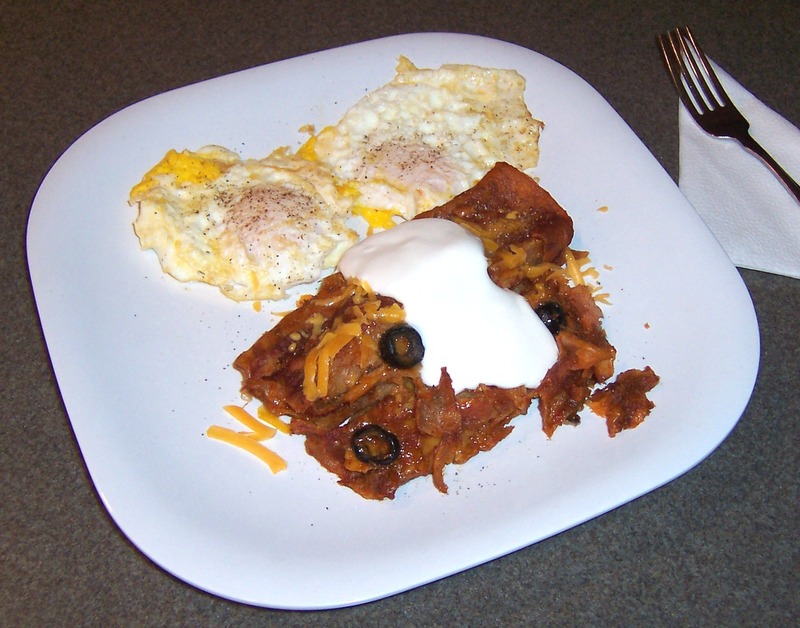 Videos of 'Viva Tirado' by El Chicano and 'Sabor a Mi' by Eydie Gorme y Trio Los Panchos, Muchismas Gracias de youtube; image of enchiladas and eggs by Oblio.